I have my 100+ cards done for a challenge on Paper Wings so now I'm just goofin'. What do you think of these? Both cards use Reece SWIC and cardstock. I really need to replenish my stock as I'm getting way low of this gorgeous paper!!! This top card also uses Inspirational Sayings set (don't you love this phrase?) 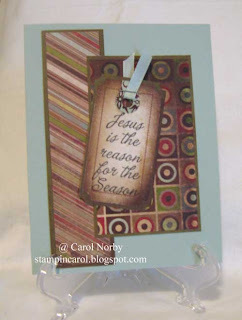 stamped with Noir PH ink on a tag from the SWIC pack and Reece ribbon. A simple design yet it has a flair about it. 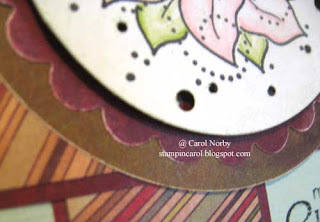 This card is a bit more complicated as I used a circle cutter, the Giga Scallop circle punch, the Mega Circle punch, and 2 sizes of small hole punches. 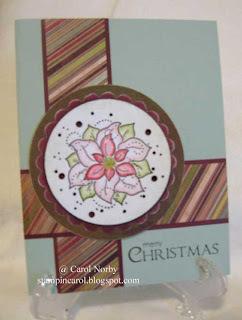 The poinsettia stamp is retired - I used it because it fit the circle so nice. The Merry Christmas is from our Hostess Level C set called Thinking Of You. I colored the poinsettia with Prismacolor H2O pencils and my Niji Aqua Flow brush. I plan on making a set of cards using these papers and either sell them or make a gift with them. I think they're turning out real cool. Maybe I should open an Etsy store and sell some of my other crafts. I also make rugs and various papercraft products. Anyway, do you have your Christmas cards done? Don't procrastinate!! You'll be sorry! LOL!